Our Get Well Soon Soap Trio includes three of our unscented soaps that may provide some help for skin challenged by chemotherapy or radiation treatments, or surgery and the resulting scar tissue that can develop: 100% Olive Oil (Castille), Unscented Goat Milk Soap, and Unscented Shea Butter Soap, made with shea butter and cocoa butter. Our Get Well Soon Soap Trio Gift Set is a thoughtful get well gift for anyone preparing for, or recovering from, surgeries and skin incisions. Each of the soaps included in this gift is unscented and completely natural, shielding the user from further skin irritation due to artificial, chemical latherers, hardeners, preservatives or colorants. 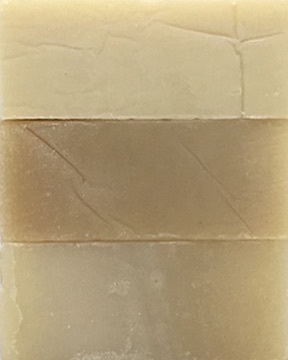 Unscented Castile Olive Soap is gentle enough for use immediately after surgery. After the incision has healed, a shea butter soap will provide additional moisture to the skin tissue stretching to cover the wound. Shea Butter is often reported as helpful in reducing scar tissue. Goat Milk soap can be used interchangeably with the Shea Butter for its ability to soothe inflamed skin and reduce itching as an incision heals. A small sample amount of raw shea butter is included in this gift for application to the surgical area either before or after surgery. The skin area where surgery will be performed will receive extensive antibacterial surgical scrubs, and although necessary for preventing infection, these chemicals will also dramatically dry out your skin. Preparing your skin for surgery by using intensive moisturizing products will ready the skin tissues that will be deprived of moisture during the initial post-surgical time.